We, Jim and Tine, have renovated our old farmhouse to make a lovely home for our family, and a place where our guests can feel welcome and at home. Lowthwaite is situated in a peaceful valley only 3 miles from Ullswater with views of Helvellyn and Blencathra. 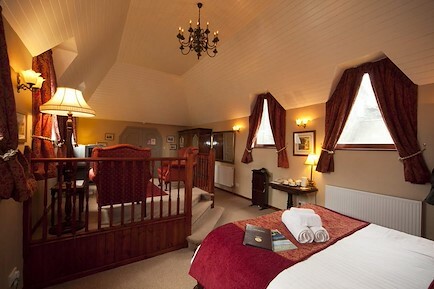 There are 4 beautiful rooms with distinctive furniture and en suite stylish bathrooms. The delicious food is homemade, using mostly local, organic and fair-trade products. Use of patio or garden terrace is available for all rooms. We previously lived in Tanzania organising Kilimanjaro climbs and safaris. Our love of walking has brought us here. Jim is using his guiding experience to make route descriptions starting from our door, as well as giving more general advice on walks in the whole area. Part of the decision to return to UK was that we have two young children. Having travelled extensively with them, we want to provide a place where children are as welcome as adults. If you have any special requests such as special dietary needs, group bookings or longer stays, please call or write, and we will do our best to help. Only 15 minutes from M6 Junction 40. Take A66 towards Keswick for 6.5 miles, then turn left opposite B5288 onto the Matterdale road. Head down into the valley for 1.25 miles and then turn left immediately after Walloway Farm. Go uphill for 0.25 miles and then fork right signposted Lowthwaite 1. We are 1 mile from this junction nestling in a hollow on the left side of the road, and the only remaining dwelling in the hamlet of Lowthwaite. There is also access to our property from Ullswater via Watermillock and from Glenridding via Dockray, but a good map is needed, as the network of small lanes can be confusing! Your enquiry will be sent directly to Lowthwaite B&B. Please fill in as much detail as you can.